This book describes an alternate Theory-of-Everything Paradigm for creation of our universe and the life herein by replacing portions of current complex scientific theories and their unexplained paradoxes with simpler and scientifically correct descriptions based on the Bible. Scientific theories are typically incompatible with most religious based creation documents since they are developed with intelligent design specifically excluded. However, the descriptions found in Genesis and then throughout the Bible are completely compatible with all current day scientific measurements if both are interpreted with compatibility in mind. Today’s cosmologists, physicists and mathematicians don’t look to any religious concepts, and specifically the Christian Bible, for scientifically technical information which can help formulate theoretical bases for test results. Still, man’s detailed comprehension of how the universe and life therein were created and operate remains elusive when based on pure science with its current mathematical models. However, it is universally agreed that life and the universe are unbelievably complex and operate using beautifully consistent design and mathematics. It is generally accepted we live in an “Elegant Universe”, as described in detail in this book by Brian Greene, and the recent TV series he hosted. All technical information described in these sources which use current scientific models can be more simply explained and without paradoxes using biblical models and a Christian based Paradigm. The universe is inherently numerical and mathematically based. The scientific process systematically increases scientific knowledge by using mathematical reasoning and equations to build upon previous concepts. To better understand mathematical formulae, scientists use models to explain them and these models then drive the direction of the formula development. These models are used to represent the physical character of the universe and life forms, and are often based on purely geometric shapes. Formulas actually describe the model, but are then used to calculate or confirm measurements taken in the physical world. It is hoped that the model actually represents reality in some way but this is optional. For example, an ellipse is a model of the motion of planets orbiting a massive object through the force of gravity, so the elliptical equation is used to predict how they move. With many other objects nearby to the one under consideration and affecting these motions by their gravity, these models become very complex so many times approximations are required to come close to reality. This type of model becomes too complicated when applied to gasses or molecules, so a switch is required to use statistical models which only determine probabilities of how the universe works. This approach has been extensively verified so is used by cosmologists, physicists, biologists, chemists and geologists, and supported by pure mathematicians, to develop their understanding and increase comprehension of how the universe and life work. The New International 1984 Version of the Holy Bible is referenced herein to explain how both the universe and life were created by the Triune God. References taken from this Bible are inserted in red bold and italic font with the chapter and verses cited. Models which increase human understanding of spiritual concepts can also be seen in the Bible where parables, analogies, dreams or visions are used instead of geometric or physical models as in science. The parable of the search for the “pearl of great value” presented in Matt 13:44-46 and confirmed with a similar model of searching for a coin in Luke 15:8 is itself intended to encourage men to search for the pearls of truth found in the “fields” of the Bible. In these cases interpretation of such wording requires a search for alternate spiritual or physical meaning of the text due to its philosophical parable or physical model nature, just as is done in science. In all cases the Bible clarifies itself by using the same language in multiple applications which, like a hidden pearl, requires a search to find their true implied meanings. Many examples of important numbers which actually apply to the universe and life are seen in parable format in the Bible, and with proper interpretation of scientific facts, support Genesis and other biblical creation descriptions. Scientific and philosophical studies naturally develop an overall PARADIGM which explains results related to theoretical concepts and mathematical formulas. The Merriam-Webster ONLINE DICTIONARY defines a paradigm as "a philosophical and theoretical framework of a scientific school or discipline within which theories, laws, and generalizations and the experiments performed in support of them are formulated; broadly: a philosophical or theoretical framework of any kind." Use of the word paradigm is typically applied to scientific disciplines, but as stated in the definition can also extend into philosophical areas of study, so it is used herein to also describe how purely Bible based philosophical concepts and parable models can be used to help form a scientifically based “Christian Paradigm”. Regarding scientific studies of matter which exists in space/time in the universe, the cosmologist’s Big Bang Paradigm is a set of theories which all assume an initial explosion of an unknown first element of matter a few billion years ago. Regarding life in the universe, biologist’s Darwinian Paradigm is a set of theories all based on evolution of species over millions of years from an unknown, first living element. There are no natural indications of how either of these first elements came into being, so these scientific paradigms can really only explain how the processes seem to proceed, not how or why these first elements originally existed. Nor do these two paradigms merge in any way since no one knows how the complex DNA design and all the life it supports could have formed from the space/time, matter and forces produced by the Big Bang. Big bang theories require that stars formed first via very weak gravity working against the outward motion of the matter produced in the explosion into and through an unknown but pre-existing “space”, plus an inexplicable instantaneous expansion of both space and matter within the first second of created time to create the homogeneous distribution of galaxies. No one has been able to explain where this space came from or what it consists of such that matter is able to move through it, how far it extends beyond the current state of expansion, or what caused and stopped the instantaneous extra expansion. Stars supposedly formed first from ignition of matter caused by excessive gravity within matter, and produced the known elements up through iron. These stars then exploded with enough energy to produce the heavier elements and distribute all elements back into the universe. Eventually this new matter coalesced again to form into new solar systems with associated worlds and moons. Other matter unexpectedly merged on these new worlds, sprung into life and produced millions of varieties of life. These miracles all resulted in a mere 100 billion light year diameter universe created over 14 billion years, an insignificant size compared to the actual 1010 billion light year universe, but created in only 1.44 billion years through and for the Word of God as described in the Bible. Life theories currently have no explanation for how the first living elements were created and flourished, but the Bible explains this as well. In contrast to these long term events, the Bible provides a true theory of everything by explaining the creation of light homogeneously within the void to form expanding space/time with its acceleration into the void to provide gravity. This space/time was created via continual addition of new light energy from trillions of Heaven Lights, and light is also systematically converted into 12 fundamental particles of matter and needed forces within the 12-dimensional universe. Life was separately created by God using DNA with its development into vegetable and animal life and finally man, the image of the Triune God. Man eventually transitions from his earthly body at physical death into eternal life in a new heavenly body as angel spirits made up from heavenly particles to continue living for eons of years. The Bible shows that the entire universe is a living, growing, and well maintained organism, inhabited with human and spiritual beings as well as God himself, living in different physical bodies in separate sections of space/time in the huge but finite universe. Many scientifically knowledgeable Christians still attempt to justify Genesis-based creation using existing scientific paradigms, but this cannot succeed due to persistently restricted and literal interpretations of scripture which are incompatible with currently incorrect scientific theories. Both models need partial reevaluation or they will remain mutually exclusive studies. There must be basic but limited changes on both sides if they are to become compatible. This doesn’t imply that the Bible is wrong in any way, or that scientific understanding is all bad, just that our current human interpretation of the Bible’s pearls of truth and current biological and cosmological paradigm models each need simultaneous reevaluation. There are truths in both sources which only need to be seen as being compatible so that they can be merged and thereby simplify the scientific paradigms which have become more and more complex as they attempt to explain new measurements of higher and higher accuracy. The key to this merger is recognition that a supreme designer is required to have formulated such an elegant universe, so those persons who deny existence of a god will not agree. To accomplish this convergence without disturbing the fundamental Biblical messages for man to live by in the scriptures, it must be assumed from the outset that the Bible presents only truth, inspired directly by God. Each section in the Bible must be analyzed for its deep inherent yet consistent meaning which will require considering portions to be analogies, models or parables, especially if stated to be a vision or obviously alluding to more fundamental concepts than if interpreted literally. Scientific data must provide the path to interpret the words which can then be used implicitly to explain all scientific measurements regarding the universe and life therein. It is true that using man’s logic to alter the direct meaning of sections of the Bible presents a dangerous divergence to current theological reasoning, so must be used judiciously. Wherever applicable within this study such interpretations are discussed and justified, and if personal opinions are expressed, they are indicated as being possible or probable or maybe true. Much study remains to be pursued by many scientists/theologists to flesh-out the bare bone theories proposed here. Perhaps more cosmologists, physicists, biologists, geologists, chemists and mathematicians will see the logical beauty of this Christian Paradigm, and Christian theologians will see how the Bible describes scientifically correct concepts when properly and logically interpreted. Using this single unified paradigm taken from the Bible, members of all of these disciplines may be inspired to help develop it further. Cosmologists will see the continual creation of a living, expanding, finite and very large 1010 billion light year diameter universe, embedded with galaxies which consist of central cores called heaven and other matter in arms of galaxies called earth. Matter in the heaven portion of each galaxy is in eternal orbit around its single massive Heaven Light at the center. Each Heaven Light is the source of new energy supplied continuously into the universe from the void. Matter in the earth portion is beyond the pull of gravity from this Heaven Light so cannot be kept in orbit and is leaving its galaxy. Science measures a rotation of the Milky Way at 240 million of our years. All of God’s eternal e-time measurements will be capitalized, and this rotation period of 0.24 billion years represents one of God’s Days. One rotation of our world is a 24 hour day, and one revolution around our sun is a 12 month year, both of which are images of this Day. It can be seen from Hubble photographs that all spiral galaxies near and far display one revolution of this matter, or one Day. The universe was formed over six Days and God is now resting in the Seventh Day, called Today. Galaxy edges show nothing but burnt out stars disbursing into the empty space/time between galaxies. These dust lanes are seen in all galaxies, including our own. It is clear that the light-less void of night shows through the transparent expansion surface between the universe of day and the void of night to make the background “sky” dark. There is no need to postulate dark matter, dark energy, dark flow, black holes or rapid expansion to explain galactic operation because gravity only reaches into matter in the immediate vicinity of the Heaven Light within heaven at the core of all galaxies, and the galactic matter beyond gravity’s reach in the earth portion, such as the arms of spirals, is obviously leaving its galaxy. Galaxies are probably not affected by each other through weak gravitational forces, but may be inter-related via a currently unknown universal force, Fu which has not as yet been formulated by cosmologists and physicists since it is outside man’s purview. Physicists will see the Spirit’s continuous transformation of all new light energy specified and provided by the Father through the Son’s heaven light lamp stands to produce (a) eleven dimensional space/time itself, or (b) twelve quantum particles and twelve antiparticles, or (c) the three nuclear force fields. The mathematical form for design conversion is Ei = kicsctce, with ki being the equivalent of (a) the entropy constant ki = A/4Għ for space/time described in the Bekenstein/Hawkings equation, (b) the Higgs field for mass, mi = kics as formulated by Einstein, and (c) nuclear forces where ki is specified by the electromagnetic, strong and weak nuclear forces. Gravitational force is created by the expansion acceleration of the universe into both larger and smaller dimensions as formulated by Newton with ki incorporating man’s number, 666. 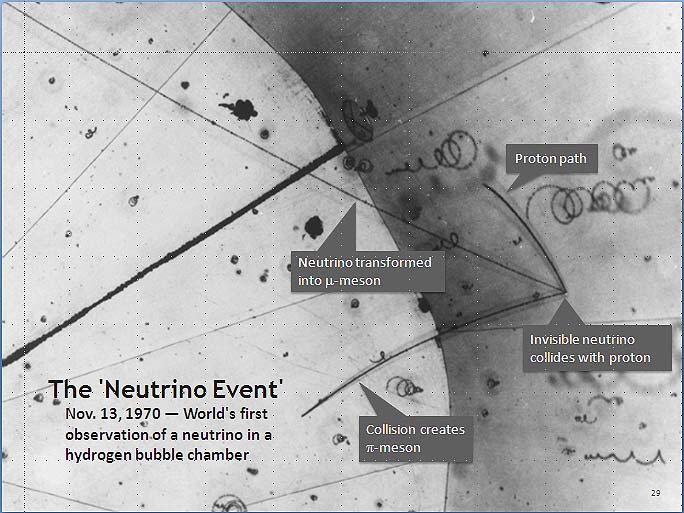 It will be seen that the 12 elementary particles/anti particles called by scientist’s quarks, electrons, and neutrinos, are God’s precious stones described in the high priest’s breastplate and later in the foundations of New Jerusalem. These elementary particles are divided into three groups of four; set 1 are lightest and related to the Spirit and our world, set 2 are heavier and related to the Son, and set 3 are heaviest and related to the Father. Particles in set 1 form the mass for man’s residence in earth while sets 2 and 3 form the mass for the Triune God and the angel’s spiritual residence in heaven, and possibly even the void. Each set of four elementary particles are similar to each other in terms of physical properties and chemical characteristics, and are related to each other using Bible-based numbers for their relative masses. The lightest set are stable in our world, while the middle and heaviest sets are only stable in heaven because of the time spread ratio between heaven and earth. This time-based ratio is called herein the angels ratio, α = 3.5 x 105. This ratio is stated in the Bible to be one thousand angel-years being equal to one of man’s days, and vice versa, with an earth year being 350 days at the time of creation. This ratio applies to all physical characteristics between humans and angels, including physical body size in space/time, mass, acceleration, and the range of frequencies of light visible to human’s eyes as compared to angel’s eyes. It describes the span of mass of the fundamental particles between the light electron and heavy tau quark. Other ratios between elementary particle masses include Bible-based factors, including 3.5, 40 and 42 with various powers of 10. The total span from the lightest neutrino to the heaviest tau quark is 7.7 x 107. God’s ratio is proposed to be the angel’s ratio times the ratio between a rotational Day for God and a rotational year for man, which is 24 x 107, so God’s ratio, ω = 84 x 1012. This ratio establishes the range of frequencies of light created by God compared to man’s frequencies for his sight and is the ratio between a thousand created t-time seconds and an eternal e-time Second. God resides in the universe’s 12 dimensions and His 12 precious stones so the Father, Son and Spirits are merged in all energy/matter in all space/time, making up One Triune God. 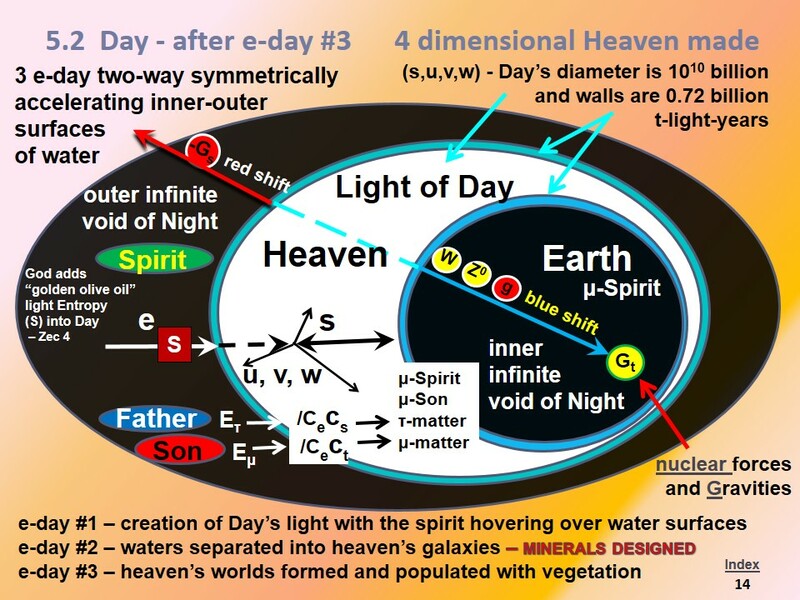 Biologists will see the Spirit’s creation of each kind of life on our world during the third creation Day and then how various species of each kind were adapted to their changing environments over the ensuing four Days or 0.96 (about one) billion years by angels in heaven. Jesus was born about 2,000 years ago so man was perhaps created about 53,000 t-years ago if calculated from the Bible’s genealogy tree at 666 years per generation between Adam, made at the end of the sixth Day just before God Rested, and Jesus birth. A possible alternative to this age of man would be the 3.5 million years it took our world to travel at its current speed of 666 km/sec from its eternal orbit in heaven when Adam and Eve sinned, to its current location 7,000 light years from the edge of heaven where one of today’s remnant of believers live. This alternate method of calculating the age of man is 70 times longer than the first, so needs further analysis to establish the true profile for our solar system’s motion through our galaxy in both e-time and t-time. A third alternative for the age of man which is ten times this latter value is discussed in Chapter 7. Large animals such as dinosaurs were probably gone before any of these options for man, and new life forms of existing types of plants and animals continue to be redesigned by angels since before the time of Noah. Chemists will see how the 12 fundamental particles merge to form physical and organic matter in the earth portion of the universe, and spiritual matter in the heavenly portion. The atoms of matter which forms the Trinity model for the Triune God in heaven consists of one of each of God’s precious stones. This atom is modeled in a dodecahedron shape within the model for space/time and dimensions of the universe. Heavenly matter is transient in the earthly portion of the universe outside of heaven due to the extreme difference in awareness of time between them. A single second of our time is like four angel days, yet an angel is also able to see four of our days pass every angel second if they wish. Therefore the high energy particles are transient in our four dimensional space/time. Geologists will be able to see the history of direct creation of vegetation without evolution during the half billion years of the third and fourth Days, and animal kinds and finally man during the half billion years of the fifth and sixth Days of creation. The world was created during the third Day so is about four Days old, covering the most recent 0.84 billion years. Stars were created on the fourth Day so are three Days or 0.72 billion years old. Adaption of life kinds into new species occurred both before and after the flood which occurred about 46,000 years ago, 7,000 years after Adam and Eve’s sin when only a remnant of 8 men and women of Noah’s family remained on our world. Mathematicians will be able to assist cosmologists and physicists to refine their analysis of light/space/time, light/energy/matter, light/forces, and gravity within the universe using the dodecahedron model, including the Bible’s ten space dimensions with their various sizes and weights of all matter, and how physical and organic matter operate mathematically in two time dimensions. The seven space dimensions added to our three may allow mathematicians to explain the curvature of space/time as formulated by Einstein to model gravity’s effect on bodies moving through our 11-dimensional space/time. Perhaps one mathematician mentioned later could go back to the insights behind general relativity and quantum field theory and dare to imagine a world more strange, more beautiful, but ultimately more reasonable than our current theories of it, and use the Bible to provide that philosophical reflection which is bound to be of help. Theologians will see how the Word of the Bible truly forms a single scientific paradigm which explains formation and maintenance of both the universe and life. This Word has the added benefit of confirming where our physical angelic spirits will reside with the Triune Father – Son - Spirit in eternal orbit around our Heaven Light after our death. Those selected through faith in that Word, which is Jesus the Son of man and Firstborn Son of God, will become the bride of Christ. The model of the City of the Bride and of New Jerusalem will be seen to represent the entire universe with its wall of expansion, and also all galaxies where God the Father provides the heavenly light and God the Son is their lampstands. It also represents the Body and Bride of Christ who are saved human spirits, and also the Triune God who exists bodily in heaven. Most life structures have been found to repeat as they grow as represented by fractals with a single format being used over and over. So also the single structure modeled in the Bible as the City of the Bride and New Jerusalem appear to be used over and over to represent the design of the universe and life within it. The size of this model is described in Revelation to represent God the Son in heaven, the size to represent the heavenly portion of a galaxy is scaled by the angels’ ratio while the size to describe the universe is represented by God’s ratio.discussed in Chapter 3. What better place to look for deeper philosophical reflection than the Bible?